Definition at line 1823 of file btrfs_drv.h. Definition at line 196 of file winternl.h. Definition at line 1827 of file btrfs_drv.h. Referenced by LdrpInitializeProcess(), NtProcessStartup(), RtlDeNormalizeProcessParams(), and RtlNormalizeProcessParams(). Definition at line 1507 of file rtltypes.h. Referenced by BasePushProcessParameters(), and RtlCreateProcessParameters(). Definition at line 1506 of file rtltypes.h. Referenced by BasePushProcessParameters(), CreateProcessInternalW(), and RtlCreateProcessParameters(). Definition at line 1520 of file rtltypes.h. Referenced by BasePushProcessParameters(), GetStartupInfoA(), and GetStartupInfoW(). Definition at line 1521 of file rtltypes.h. Definition at line 1518 of file rtltypes.h. Referenced by BasePushProcessParameters(), GetStartupInfoA(), GetStartupInfoW(), InitThreadCallback(), and IntFixWindowCoordinates(). Definition at line 1519 of file rtltypes.h. Definition at line 1529 of file rtltypes.h. Definition at line 1511 of file rtltypes.h. Referenced by BasePushProcessParameters(), InitExeName(), LdrpInitializeProcess(), RtlCreateProcessParameters(), RtlDeNormalizeProcessParams(), RtlNormalizeProcessParams(), test_RemoveDirectoryA(), and test_RemoveDirectoryW(). Definition at line 1505 of file rtltypes.h. Referenced by NtProcessStartup(), and SmpExecuteImage(). Definition at line 220 of file winternl.h. Definition at line 1526 of file rtltypes.h. Referenced by CreateProcessInternalW(), GetStartupInfoA(), GetStartupInfoW(), InitThreadCallback(), RtlDeNormalizeProcessParams(), and RtlNormalizeProcessParams(). Definition at line 223 of file winternl.h. Definition at line 1512 of file rtltypes.h. Referenced by LdrpInitializeProcess(), RtlDeNormalizeProcessParams(), and RtlNormalizeProcessParams(). Definition at line 216 of file winternl.h. Definition at line 217 of file winternl.h. Definition at line 210 of file winternl.h. Definition at line 214 of file winternl.h. Definition at line 212 of file winternl.h. Definition at line 211 of file winternl.h. Definition at line 215 of file winternl.h. Definition at line 213 of file winternl.h. Definition at line 1515 of file rtltypes.h. Referenced by BasePushProcessParameters(), KsecGatherEntropyData(), NtProcessStartup(), RtlCreateProcessParameters(), RtlpInitEnvironment(), and RtlQueryEnvironmentVariable_U(). Definition at line 1531 of file rtltypes.h. Definition at line 1534 of file rtltypes.h. Definition at line 1522 of file rtltypes.h. Definition at line 1504 of file rtltypes.h. Referenced by BasePushProcessParameters(), LdrpInitializeDotLocalSupport(), LdrpInitializeProcess(), RtlCreateProcessParameters(), RtlDeNormalizeProcessParams(), RtlNormalizeProcessParams(), RtlpInitEnvironment(), SeiInit(), and SmpExecuteImage(). Definition at line 204 of file winternl.h. Definition at line 202 of file winternl.h. Definition at line 203 of file winternl.h. Definition at line 1826 of file btrfs_drv.h. 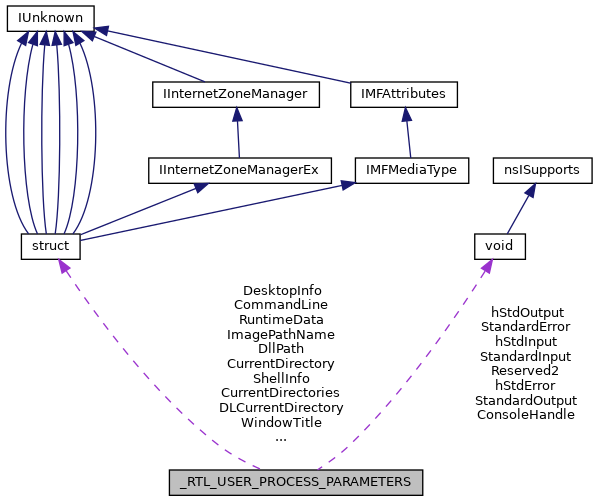 Referenced by LdrpInitFailure(), LdrpInitializeDotLocalSupport(), LdrpInitializeProcess(), LdrpRunInitializeRoutines(), NtProcessStartup(), RtlComputePrivatizedDllName_U(), RtlDeNormalizeProcessParams(), and RtlNormalizeProcessParams(). Definition at line 1503 of file rtltypes.h. Referenced by BasePushProcessParameters(), RtlCreateProcessParameters(), and RtlpInitEnvironment(). Definition at line 1502 of file rtltypes.h. Definition at line 1824 of file btrfs_drv.h. Definition at line 1825 of file btrfs_drv.h. Definition at line 1528 of file rtltypes.h. Referenced by GetStartupInfoA(), GetStartupInfoW(), RtlDeNormalizeProcessParams(), and RtlNormalizeProcessParams(). Definition at line 222 of file winternl.h. Definition at line 1527 of file rtltypes.h. Definition at line 1524 of file rtltypes.h. Referenced by BasePushProcessParameters(), GetStartupInfoA(), GetStartupInfoW(), and InitThreadCallback(). Definition at line 197 of file winternl.h. Definition at line 1510 of file rtltypes.h. Referenced by BasePushProcessParameters(), CreateProcessInternalW(), GetStartupInfoA(), GetStartupInfoW(), GetStdHandle(), SetStdHandle(), and TranslateStdHandle(). Definition at line 1508 of file rtltypes.h. Definition at line 1509 of file rtltypes.h. Definition at line 1516 of file rtltypes.h. Definition at line 1517 of file rtltypes.h. Definition at line 1523 of file rtltypes.h. Definition at line 1525 of file rtltypes.h. Definition at line 218 of file winternl.h.